Hardwood Medallions are the crème de la crème of hardwood flooring. Wood Medallions are available in the designs shown below or in a custom design of your own, e.g., a family crest or a corporation logo. Floor medallions are executed by our master craftsmen in the listed wood species or species combination of your choice, in standard or custom sizes and thickness. 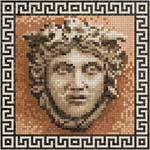 You may customize any floor medallion with the elements from other flooring medallions or borders. Wood medallions are grand and easy way to beautify the existing floor. FREE ROUTER BIT, TEMPLATE INCLUDED. 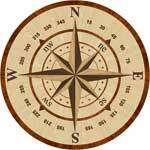 Check our line of 30" or smaller wood medallions ! Many popular floor inserts available in stock! We include carbide tipped routing bit , template, latex gloves with every wood medallion. 60" and larger medallions are available in stock. What is the right floor medallion size for the room? A good rule of thumb is to choose the size of Wood Medallion to be about 1/3 of the width of the room. For example, if the room is 20' long by 15' wide, the floor medallion can be 60". Click on the appropriate thumbnail image to review the wood floor medallion prices, wood species and description. In the detail window, make sure to click on the examples images, where available, to see the astonishing floors created with our distinctive hardwood medallions. The floor medallion can the center focal point of your room. An interesting application for the flooring medallions is to use them as custom stair landing. 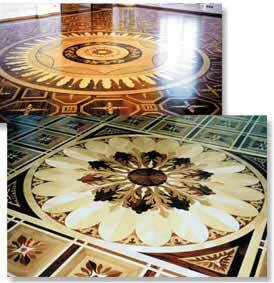 For even more intricate floor inlays and marquetry check the Marquetry category. 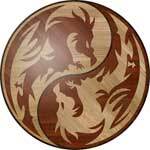 Prices are shown for standard sizes, 3/4" thick, unfinished wood medallions. Most of the floor medallions can be scaled up to any size. Twelve-feet diameters are not unusual. If you are interested in the custom floor medallion, special size, please use the contact form or call us Toll Free at 800-577-2927 to place an order or ask questions. Irregular form wood flooring medallions are shipped with installation template at no additional cost. Installation instructions and routing bit are included with every hardwood medallion. See our F.A.Q. page to find answers to the most common questions about floor medallions, hardwood borders and parquet flooring.